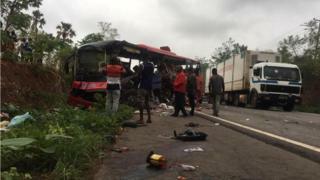 "Most of the passengers in both vehicles died at the spot. A number of them with varying degrees of injuries have been rushed to hospital," a police spokesperson said. Road accidents are common in Ghana. An average of six people die every day on Ghana's roads.